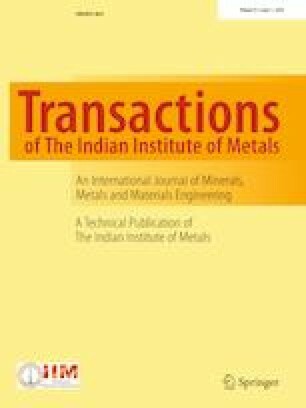 This work focuses on the investigations of hybrid reinforcement of SiC/Al2O3 as dual particle size and triple particle size (TPS) on the surface hardness of hybrid aluminum matrix composite (AMC) prepared with synergistic combination of fused deposition modeling, vacuum molding (V) process and stir casting. It was observed that TPS-based SiC resulted into highest microhardness of 45HV. Further, ANOVA revealed that the percentage contribution of particle size and type of reinforcement on surface hardness of AMC were 27.30% and 48.72%, respectively. The best parametric setting (of input parameters) for microhardness is: particle size—TPS, type of reinforcement—SiC, vacuum pressure—350 mm of Hg, sand grain size—70 (AFS no. ), vibration time—4 s. and composition/proportion of reinforcement in Al matrix—10%, respectively, and overall, 5.1% improvement in microhardness was observed at proposed parametric setting. The presence of Al2O3/SiC responsible for the improvement in microhardness was supported by photomicrographs. The authors are thankful to I. K.G. Punjab Technical University, Kapurthla (Pb. ), India, and Guru Nanak Dev Engineering College, Ludhiana (Pb. ), India, for providing this opportunity and support.